New Year, Valentine’s Day, St. Patrick’s Day and Easter, Mothers Day, Fathers Day, Graduations and all the other celebrations of the year, it’s often a time to send greetings. Some people don’t send cards anymore, and many people keep journals of their days electronically, but still some of my most popular products are greeting cards and calendars. One of the things that most inspired me to begin blogging was the stories of the cats I’d rescued, the rescued cats I’d met, and the people who rescued them, and the art I’d created through the years from my own cats and all the others I’d met. Being able to share those stories and art encouraged me to do even more with the art and the stories resulting in dozens of greeting cards, calendars, prints and handmade and unique items. Great Rescues Day Book and nearly all the greeting cards offered here were a result of that. You may also know that another portion of what inspires me to create is the time I spend in nature, whether it’s my back yard or the woods, fields, trails and waterways I enjoy visiting. I have offered a few greeting cards with my nature and landscape art and photography through the years, but it wasn’t until I met this responsive audience that I had feedback to help me focus on what readers liked and design cards in these themes as well. At the beginning of 2014, to celebrate my fifth anniversary in blogging on The Creative Cat, my fourteenth year working at home and my twenty-second year in business I pulled them all together to create this set of correspondence materials including inspirations from every area of my art. So what’s in this package anyway? 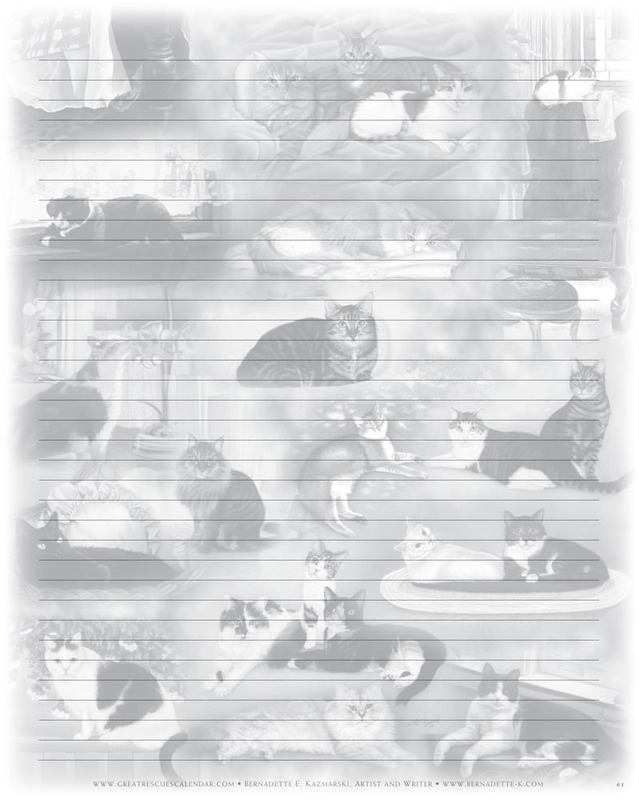 All the materials for you to keep track and send greetings for birthdays, anniversaries, events and any other noted or annual life event for yourself, family and friends in Great Rescues Day Book, and 70 greeting cards to meet the occasion in a mix of feline-themed cards and cards inspired by nature. 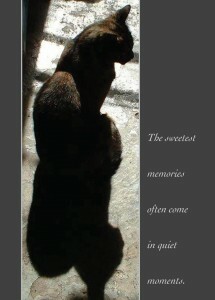 The combined value of Great Rescues and all the greeting cards would be just about $132.00. I offer this package of correspondence for $75.00. And you can either use all the contents for yourself, or give Great Rescues or individual sets of cards as a gift, so you take care of correspondence and shopping for gifts all at the same time. New format, same great kitties! If you’re familiar with Great Rescues Calendar and Gift Book, this book carries on the idea in a way that’s much more permanent. 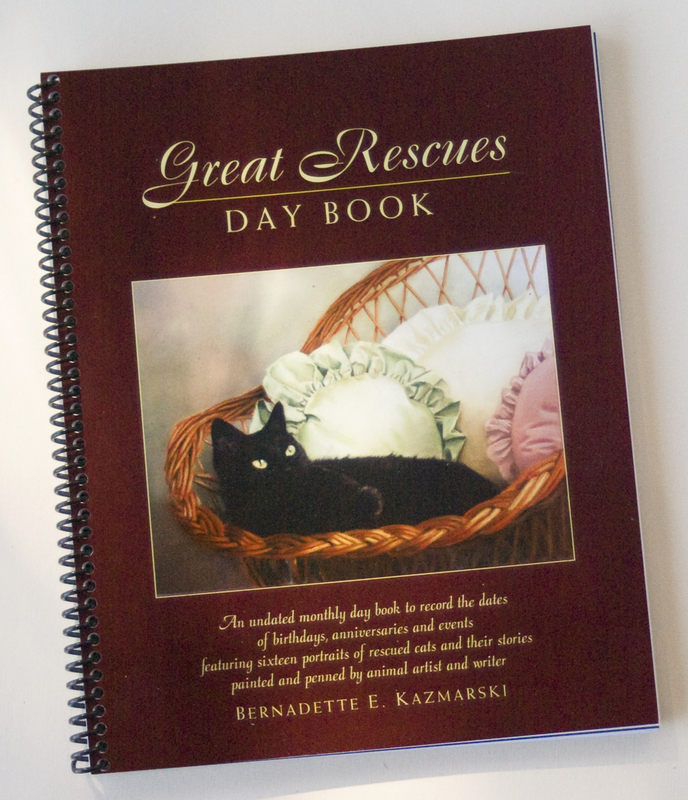 Great Rescues Day Book book is not dated for one year, but has all the dates in a month for you to fill in the birthdays, anniversaries, holidays and social and personal events in your life. 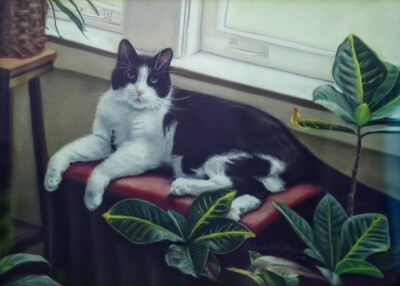 I had long wanted to share those stories and the lovely kitties I’d painted. 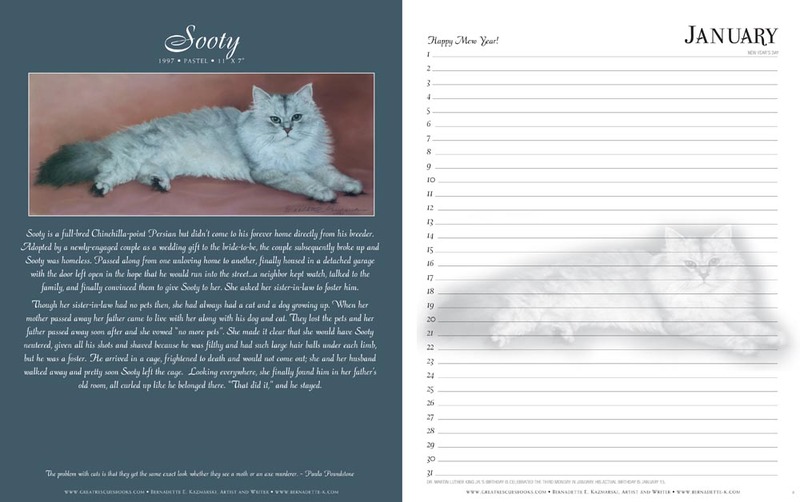 Great Rescues Calendar and Gift Book brought these stories and portraits to people who love animal rescue and feline art, but as a calendar it had a limited time to share its message. This day book still shares the stories and art, and can do that for years to come. And while each cat has an individual story, each rescuer has a story as well of reaching out to an animal in need to bring it in from the streets—because rescue is really about the rescuer as well as the rescued. In many cases they helped heal physical and emotional wounds and gave that cat a lifetime of love, in return receiving love and devotion; often those humans received some healing in return they weren’t aware they needed. You can also read the individual stories of the Great Rescues families. Most likely you’re familiar with my feline-oriented greeting cards for sympathy, holidays, and all-occasion. 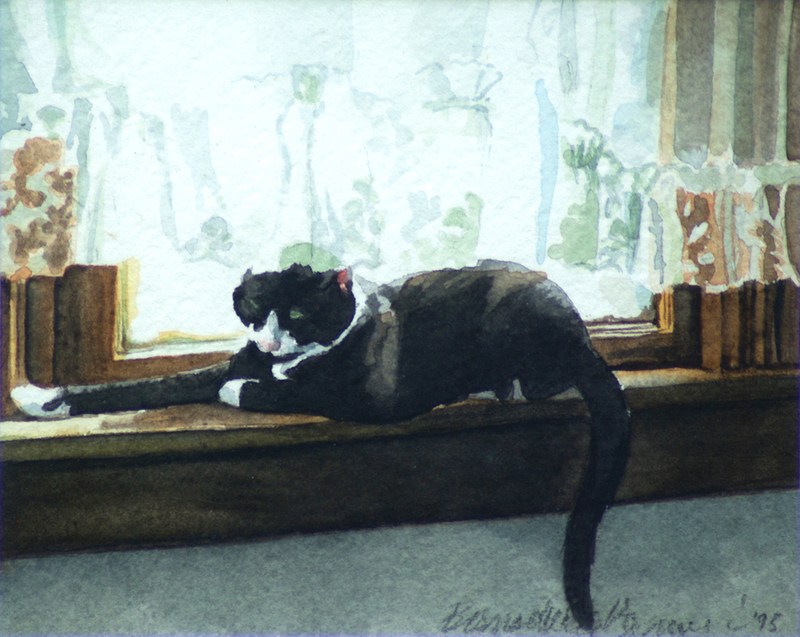 For nearly as long as I’ve photographed and painted cats, I’ve photographed and painted flowers, gardens, the woods and fields, the essences of nature that I love, and once I’d begun offering feline greeting cards I also designed and printed greeting cards inspired by nature. At one time they were all different sizes but at one point I made them all 5″ x 7″ so they could assort with each other, and I didn’t have to have eight different styles of envelopes on hand! In addition to the feline cards you’ll expect in this package, I’m also offering two sets non-feline cards for those occasions as well. All cards come with matching envelopes, and each set of cards will be packaged in an individual greeting card box. I’ll start with those since they are likely all new. 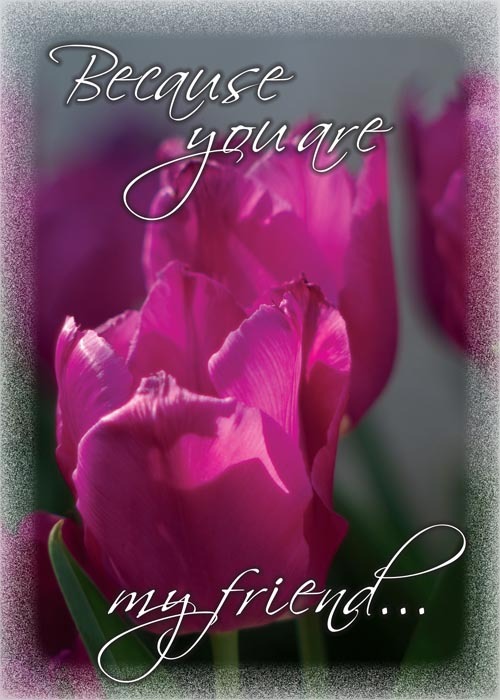 “Because You Are My Friend” greeting card. These are designed from my own photos of my garden and yard and my walks along trails and natural areas. Each photograph inspired a sentiment and thus became this line of simple greetings, so unlike most other cards I design which only feature the image, these actually have a message on the outside of the card including sympathy, birthday, get well, inspiration and friendship. All cards are blank inside. At left, two pink tulips bring a warm and cheerful message for friendship, sympathy, support or just a hello, “Because You Are My Friend”. 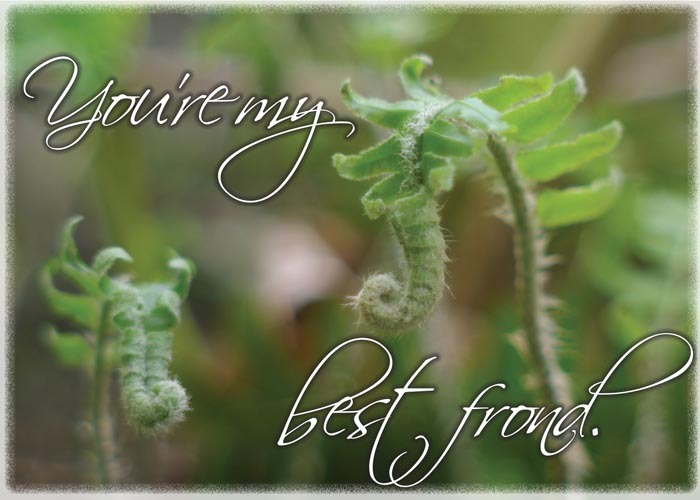 At right, two young ferns in the woods along the trail where I regularly walk sprout, unfurl and become BFFs—”Best Ferny Fronds”—in “You’re My Best Frond”. Click here to see all the designs and read a little more about each in my online Marketplace. 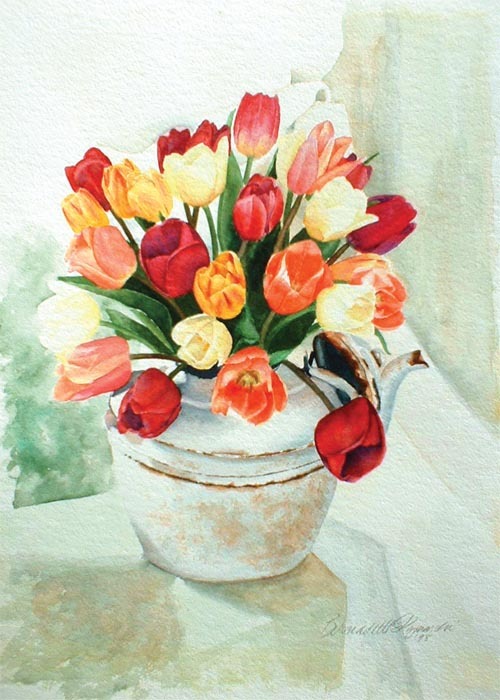 “Tea for Tulips” greeting card. These cards feature my favorite paintings of gardens and still lifes, many scenes from my own yard and home. They have only the art outside and are blank inside, and I think just as many people have framed them as have sent them as greeting cards. 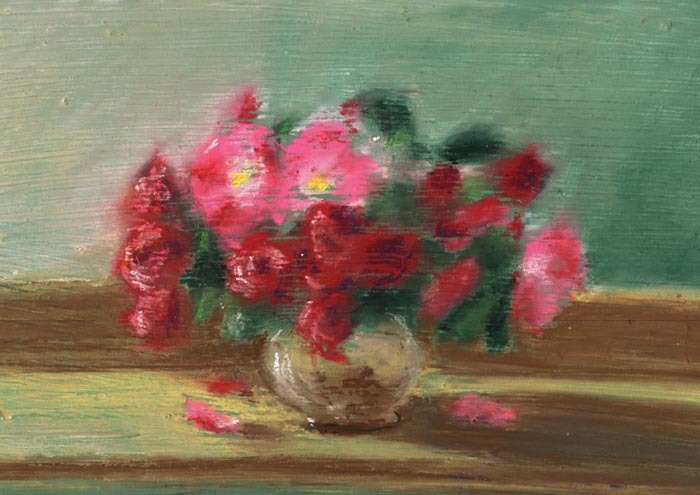 At left a still life of the really old-fashioned roses in my yard, a fragrant old deep red tea rose and a bright pink pasture rose in a little daily sketch I did in my dining room in “Small Roses”, because the sketch was about 4″ x 6″. At right a watercolor of tulips in an old rusty teapot on a sunny windowsill, put together from photos I’d taken in “Tea for Tulips”. Click here to see all the designs in the set. I have also found that people use these cards for human sympathy or even for “thank you”, “thinking of you” and even romance, especially for those who share a love for animals. Loss is about love, and when I designed these I focused on that love instead of the pain. Click here to read a little more about each of the cards. “Buster Lookin’ at His Toes” greeting card. These greeting cards are created from paintings of the cats with whom I’ve had the pleasure of sharing my life—and that includes a few friends’ cats as well. I’ve included a mix of pastel and watercolor and a mix of styles, from realistic detail to loose impressionistic scenes so you have a choice for all occasions. Cards have only the image on the front, are blank inside, and carry the title of the painting and information about it on the back, you can write inside it whatever you want. 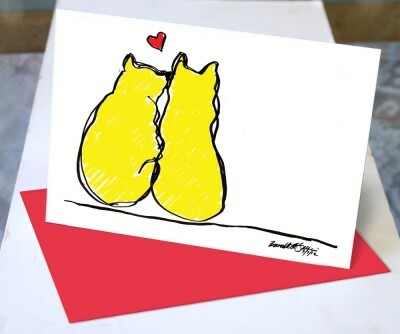 “Two Yellow Cats”, Valentine card based on a daily sketch! You’ve seen this set over and over recently! This set includes a mix of photos, sketches and illustrations, some with a greeting inside and some without, and some can even be used as all-occasion cards. These cards come with red envelopes. Click here to see the designs and read more. As an artist I turn to my surroundings for creative output, and what better to do with a family of five black cats during the festive Halloween season? 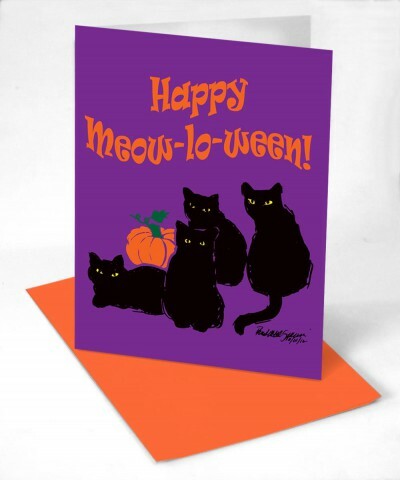 I posted many of these photos on The Creative Cat for my daily photos during 2010, and from the feedback decided I needed to have Halloween cards! I added a new one this year from a daily sketch. Each of the cats depicted here is one of mine except the calico who belongs to my neighbor–and I just had to use that photo! 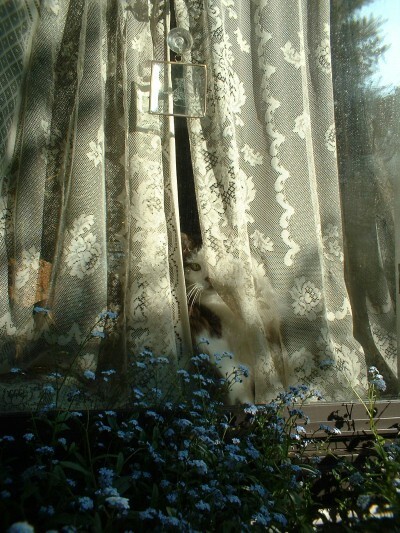 Click here to read more about Victoriana Cats. “Compositions in Black and Green” greeting card set. The set includes two familiar images, but really focuses on one kitty—Jelly Bean! “God, I’m Cute” pictures Jelly Bean admiring himself in the mirror long offered as a greeting card, and “Drink Straight From the Tap” shows the Fantastic Four all drinking from the sink faucet at the same time. The new designs are “Composition in Green and Black”, offered by request but one of my favorite atmospheric images of Jelly Bean dozing in the sun on the edge of the sink, and “Toe Cleaning in Green and Black”, the Bean once again in a close-up capture of activity with the mint green sink reflecting on Bean’s black fur and paws. 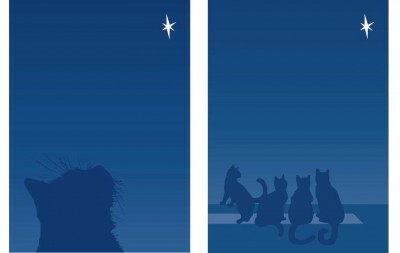 Because I have sooo many feline holiday cards, this will only include the two most popular, “Star of Wonder” and “Can We Get That Thing?”. A few steps closer, there it is. You’d think I’d have a bazillion cards in this category, but I have only two that aren’t used in other sets: “Sophie Keeps an Eye on Things” and “A Sunny Room”. That may sound like a lot of cards, but believe it or not, it’s not all the cards I offer! I also have wildlife cards, and cards made from my nature paintings, and a set called “My Home Town” that is my paintings and sketches of Carnegie! But I love giving others a means of sending a message. Card sets all come packaged in greeting card boxes, and I often toss in a few extra cards if I have some new ones I’d like to share.